* The Greek system is the largest network of volunteers in the US, with members donating over 10 million hours of volunteer service each year. * Every U.S. President and Vice President, except two in each office, born since the first social fraternity was founded in 1825 have been members of a fraternity. * 76% of all Congressmen and Senators belong to a fraternity. 40 of 47 U.S. Supreme Court Justices since 1910 were fraternity men. 71% of those listed in "Who's Who in America" belong to a fraternity. * There are 123 fraternities and sororities with 9 million members total. * Of the nation's 50 largest corporations, 43 are headed by fraternity men. * A U.S. Government study shows that over 70% of all those who join a fraternity/sorority graduate, while under 50% of all non-fraternity/sorority persons graduate. * Less than 2% of an average college student's expenses go toward fraternity/sorority dues. * Over 85% of the student leaders on some 730 campuses are involved in the Greek community. The American college fraternity is one of the few institutions on our higher educational structure which was invented by us and not borrowed from European models. Not surprisingly, it has been a symbol of American college student independence, pride, and leadership. Fraternity men represent about 2% of the male population of America. What is happening to that 2% ? They are leading this nation! Approximately 80% of the executives of the 500 largest corporations in America are fraternity men. More than three fourths of our U .S. Senators are fraternity men, as are a majority of the men listed in Who's Who in America. Of the sixteen U.S. Presidents who had a chance to join a college fraternity, thirteen took advantage of the opportunity. So many college presidents have been fraternity members that the total would run into the thousands. How and why are fraternities able to produce such a large percentage of our nation's leaders? The easiest way to answer this question is to examine just what happens in a fraternity. A college fraternity provides a young man with the opportunity to learn how to work together with people, whether it be for the highest grades, the best homecoming float, a community service project or merely to keep the house clean. A fraternity provides a unique combination: family, home away from home, social organization, business and organization in which students can develop confidence as they acquire competence. The opportunities for leadership are unlimited and the most important thing is that the principles of leadership are learned through experience. This experience teaches fraternity men that success is not automatic, but rather, that knowledge and performance are what count most. A fraternity man learns how to develop sensitivity regarding the desires, goals, and aspirations of others; how to communicate, how to inspire, how to motivate; the importance of setting an example; how to delegate responsibility; and how to accept failure as well as success and glory .He learns that a true leader must have the courage to stand up for his beliefs, while also being attentive, interested, and responsive to those who may disagree. Too many students come to college, sign up for classes, study from test to test memorizing material and feeding it back at test time. They may get good grades and graduate, but it is surprising how many college graduates are wandering around looking for jobs because they did not develop the ability to work with people or the basic qualities of leadership while they were in college. The qualities of leadership must be tested and developed by each person and a fraternity provides the opportunity for students for just that. This is how 2% can equal 80%. Boston University boasts two founding chapters of national organizations: Lambda Chi Alpha and Delta Delta Delta were both founded at BU. The new Superior General dedicated his short term of office to restoring the texture of Jesuit life as he had known it in the old Society. Fortis' letters to the whole Society describe in detail the customs which should regulate the life of the novitiates and scholasticates. One can still find little booklets from his time containing extracts from the letters of the Generals of the old Society with lists of the occasions on which they should be read aloud during meals. The principal achievement of Father Fortis and his generation of Jesuits lay in establishing beyond question the historical continuity of the restored Society with the Society founded by Ignatius that had existed until 1773. Fortis reestablished also several provinces, including in the new world (Mexico), and three missions (Ireland, Maryland and Missouri) were depending directly on the General. Requests were coming from many places for the Jesuits to start anew the work they had been doing in the past, especially in the educational field. This prompted Fortis to initiate a revision of the Ratio Studiorum to adapt it to the thoroughly new socio-religious atmosphere of the 19th century. A sign of the new trust of the papacy towards the Society is the fact that Pope Leo XII returned to Jesuit management the Roman College, as well as the church of St Ignatius, in Rome (1824). 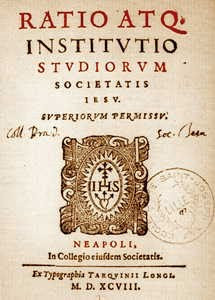 The Ratio Studiorum (Latin: "Plan of Studies") often designates the document that formally established the globally influential system of Jesuit education in 1599. Its full title is Ratio atque Institutio Studiorum Societatis Iesu ("The Official Plan for Jesuit Education"). The work is the product of many hands and wide experience, but it most directly derives from the efforts of an international team of academics at the Jesuit school in Rome, the Collegio Romano. The Society of Jesus had not originally envisaged running a network of schools when it was founded, but it soon became progressively involved in and then largely associated with educational work. The many schools taken over or started by the Society in its first decades all needed plans (rationes). In addition, an increasing number of young men were entering the Society in need of the educational background that was required for priestly service, and the Society began to assume a greater and greater role in the direction of its own formational program. For these two reasons, there grew a great desire for a standard plan for all of the Society's educational institutions. Under the generalate of Claudio Aquaviva, in 1581, a committee of twelve Jesuit priests was appointed without clear results. A new committee of six was soon formed in 1584: Juan Azor (Spain), Gaspar González (Portugal), James Tyrie (Scotland), Peter Busée (Holland), Anthony Ghuse (Flanders), and Stephen Tucci (Sicily). This committee produced a trial document, the Ratio of 1586, which was sent to various provinces for comments from the teachers. This plan was not intended for actual use in the classrooms. Reflection on the reactions led to the issuance of another document in 1591, which was to be employed in all Jesuit schools for three years. The reflection on these experiments was then used by the committee in Rome to create the final official document of 1599. One hundred years after the order's founding, the Jesuits were running 444 schools. By 1739, they were running 669 schools. The Ratio had an major impact on later humanist education. In his Renaissance Literary Theory and Practice, Charles Sears Baldwin writes, “The sixteenth century closed with the full [classical] doctrine operative in the Ratio Studiorum and in the rhetoric of Soarez” (64). 1/3 of U.S. Congress is "Greek"